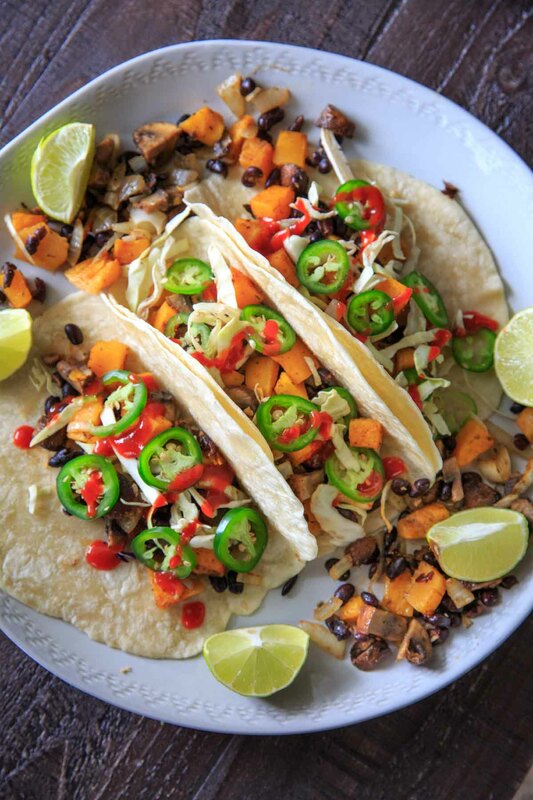 Sheet Pan Butternut Squash and Mushroom Tacos! 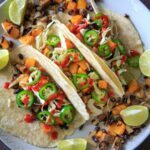 Ready in under 30 minutes – vegan, easy, healthy, and great for meal prep. WHY don’t I meal prep more often? Recipes like these remind me how easy it is to get a wholesome meal full of veggies in barely any time. 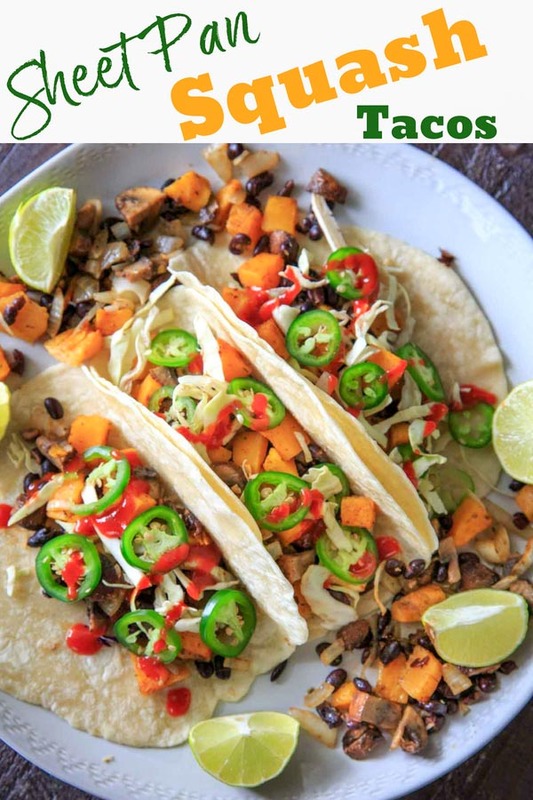 Perfect for a quick weeknight dinner or planning ahead for meal prep, this sheet pan taco recipe is from Jackie Sobon’s latest cookbook – Vegan Yack Attack On The Go! When I received my advanced copy I immediately fell in love with this cookbook. There are so many drool-worthy recipes that caught my eye, like Chipotle White Bean Salad Sandwich, Pumpkin Maple Donut Holes (!!) and Cauliflower Grill Curry Pockets. AND they are all some version of quick, portable, and/or make-ahead. AND (sometimes surprisingly) VEGAN. So if you are a person who wants amazing vegan treats like these that fit into a busy lifestyle, go get yo-self a copy. Back to these sheet pan tacos! Sheet pan meals started to be all the rage a few years ago and now I totally get why. Since we want all the veggies to cook evenly, the trick is to dice instead of cube the butternut squash for faster cook time. If you buy pre-cut squash you will want to dice it up a little more. I may or may not have forgotten to do this until after I already mixed it all together with the spices. Another thing about the spices – the recipe seems longer than I usually prefer, but it’s because half of them are spices! For purposes of an actual recipe I included the measurements for the spices but I like to just sprinkle them right on top of the veggies without really measuring. Look at me – I’m such a rebel. 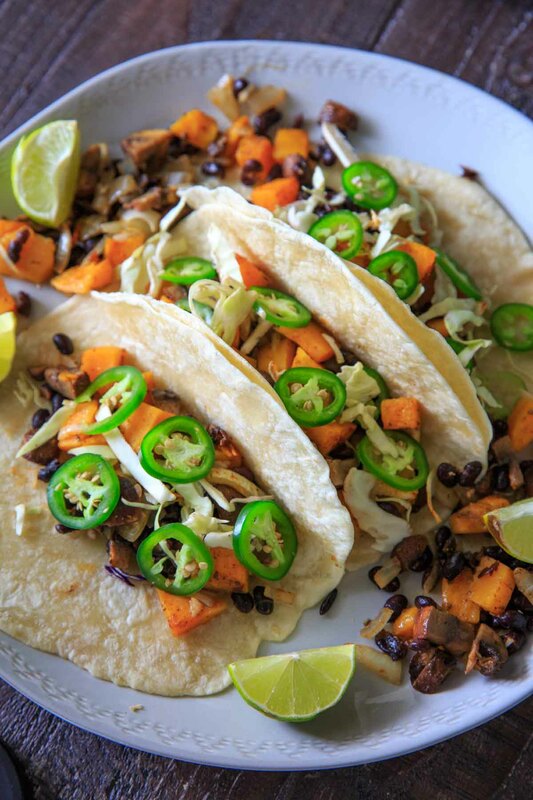 Add some shredded cabbage to your taco for crunch, jalapeno for heat and lime for flavor. If you like even a little more heat, you can add some sriracha (of course I did) and/or sweet chili sauce to balance it out. Avocados would be an excellent topper as well if you have them on hand. 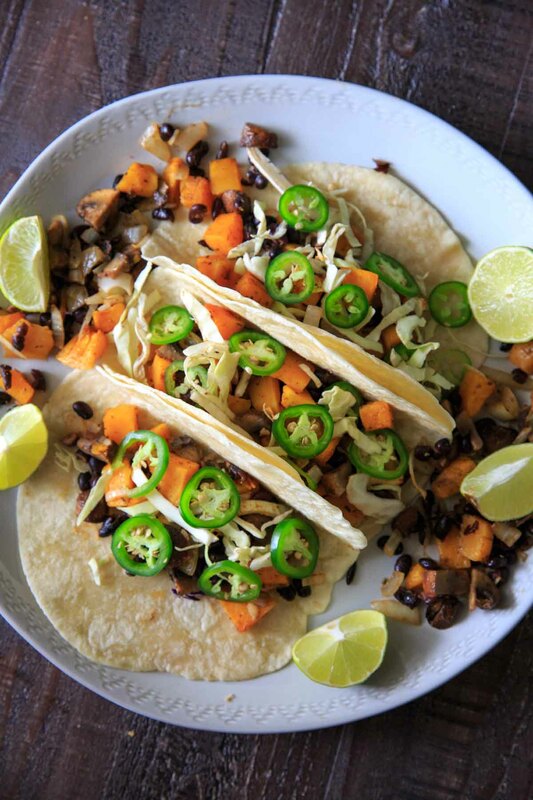 To keep these gluten-free go with corn tortillas. I prefer flour tortillas so that’s what is pictured. Do you ever make sheet pan meals? Let me know if you try this one! 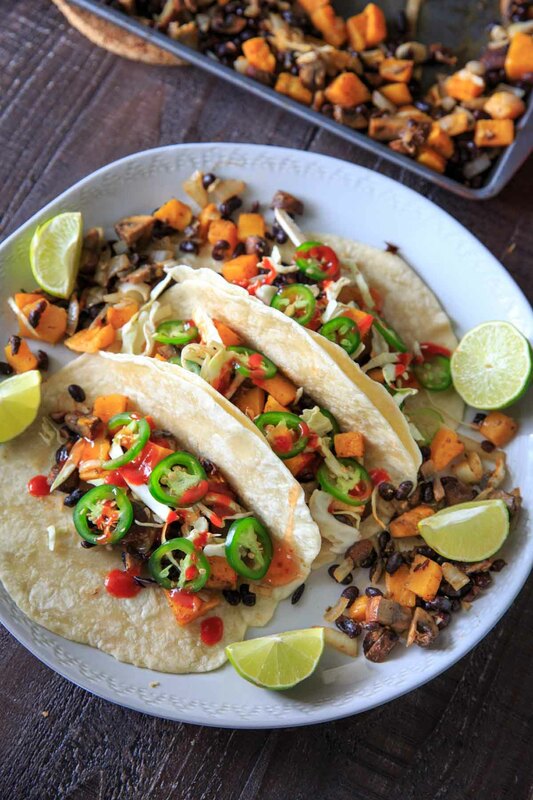 Sheet Pan Butternut Squash and Mushroom Tacos! Ready in under 30 minutes - vegan, easy, healthy, and great for meal prep. 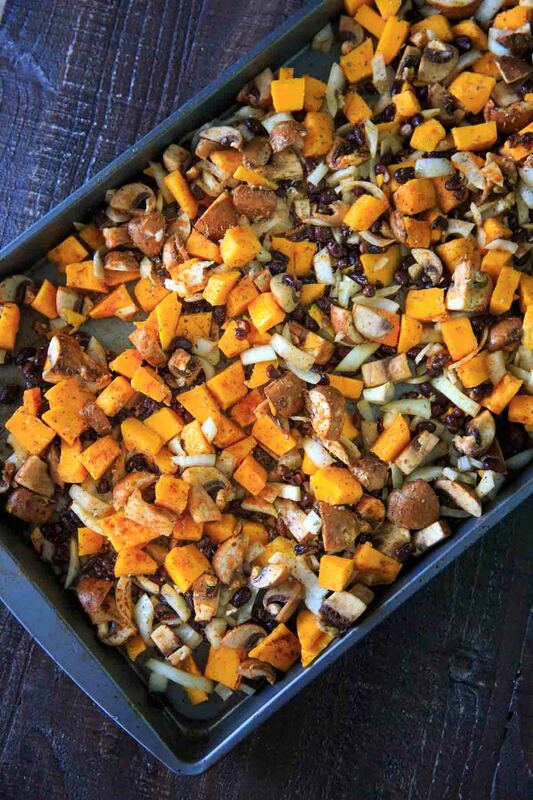 In a large mixing bowl, place the butternut squash, mushrooms, black beans and onion and add in oil. Sprinkle the spices in and toss to coat. Spread mixture out on a baking sheet, top with sea salt and add tomatillos in one corner of baking sheet. Bake at 400°F for 15-20 minutes or until squash is fork tender. 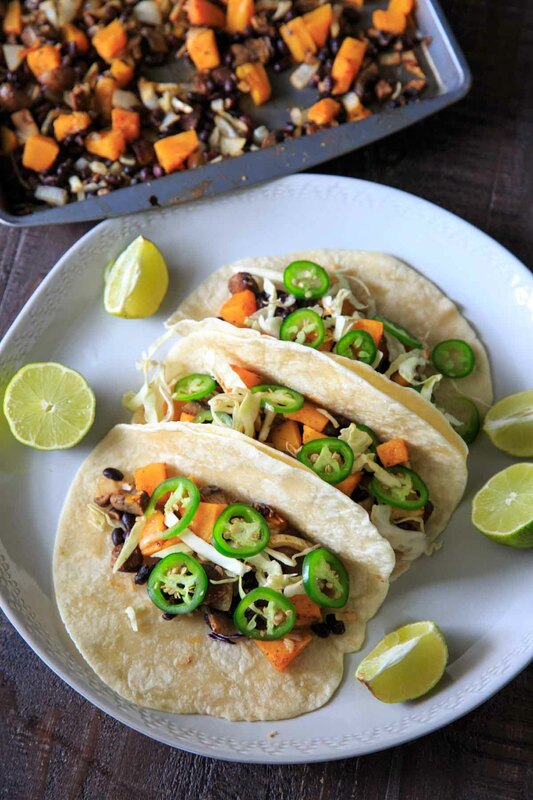 Fill tortillas with squash mixture, then top with tomatillos, shredded cabbage, and jalapeno slices. Serve warm with lime! Make sure the butternut squash is diced, not cubed! This allows for faster cook time. 2 cups is roughly a 12 oz. bag of cubed squash diced into smaller pieces. Recipe adapted from Vegan Yack Attack on the Go, with permission.